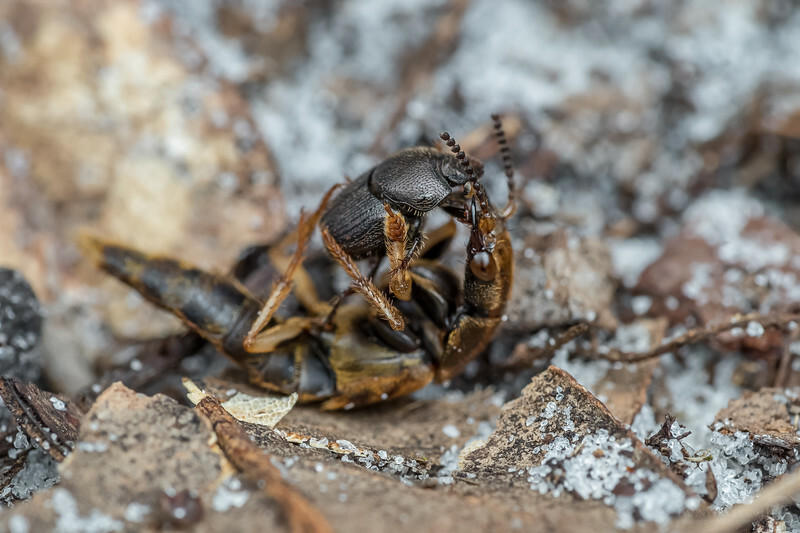 I encountered this epic skirmish between a dung beetle (smaller one; #scarabaeinae) and a rove beetle (#staphylinidae) during the bioblitz at Split Oak Forest last fall. The dung beetle fought for its life for a good 30 seconds, then I briefly glanced down to adjust a setting on my camera and when I looked up, they were both gone. I don't know who was the victor, but this was so cool to see! I'm unsure if this was predation (by the rove beetle) or a territorial dispute. If anyone has any hypotheses or further insight, I'm eager to hear as I'm not terribly familiar with either family of beetles.